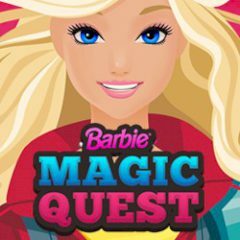 Barbie has a magic quest and she is willing to complete it. Match tiles of the same color with each other and let them disappear. Reach the requested amount of points within the moves you have. Barbie entertains herself time after time completing various quests that turn her brain on. This one she finds difficult, and probably, she won't complete it without your help. There is a layout full of varicolored tiles and your task is to match the tiles of the same color. Think before you do, otherwise you can run out of moves.